Now out! Omnibus Edition featuring the prequel and the first three books of the Blood Martyr Series. Tanith Quinn is a vampire with a lot on her mind. Between fighting off her constant blood lust, and a friend who becomes more than just a friend, plus the Were King who insists they're meant to be together, she's a walking time bomb. And that's not even mentioning a hunter who's determined to take her down, as well as old friends who would like nothing more than to see her dead. But she has a few tricks up her sleeves...and she doesn't mind using them to save the ones she loves. Even if it means she has to take on the world. My name is Tanith Quinn and I'm a five hundred year old vampire, trying to live every day to the fullest. I might have cheated Death, but he's always one step behind me, ready to take me into his cold embrace. I've been lucky so far, but no one's lucky forever. Female vampiric business owners are dropping like flies in a snowstorm and the Arcadian Council are in town to find out who's killing them. As the owner of one of the hottest clubs in the city, you'd think I'd be worried about being a target. Instead, I'm framed as the killer and the only thing I can do to escape execution by the Council is to find the murderer myself. Partnered with an old enemy who'd think I'm lower than dirt, I must clear my name before any more vampires die. Because the next head to roll just might be mine. The Arcadian Council have left Centennial City and Tanith Quinn can finally rest. But not for long. Not when she's got a deal with a demon she must undo before her best friend, a powerful human witch called Jamison Bell, finds out she's given him to one of the most powerful fallen angels in the realm of Hell. Finding the demon summoner is easy enough. But everything goes downhill when she knocks on Akira Sakamoto's front door. Pulled into a battle not of her doing, Tanith finds herself on the run from a ruthless werewolf alpha who seeks to use her to get to Akira and turn the world into his personal playground. She used to hunt werewolves. Now they're hunting her. Shifters don't forgive and they don't forget. As Tanith is about to find out. 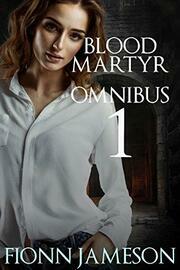 Also contains the first chapter of the next Blood Martyr book, Dark Moon Rising, to be released late June 2014. As with all Fionn Jameson titles, there is no DRM attached to this product.